This week has seen another catalogue of war crimes perpetrated against the people of Gaza, including direct and deliberate attacks on hospitals and schools. The number of dead has now exceeded 800 in two weeks, the vast majority of whom are innocent civilians. Sinn Fein leader Gerry Adams sought to recall the Dublin parliament after the UN vote, and said Irish citizens were “appalled” at the onslaught. “Hundreds of thousands of people have taken to the streets of Irish towns and cities in recent days to express their outrage at the indiscriminate killing of Palestinian men, women and children by one of the most powerful armies in the world,” he said. The resolution, which the government refused to support, sought to establish an international Commission of Inquiry into violations of human rights in Gaza. It also condemned the killing of Israeli civilians by rocket fire from Gaza. It explicitly urged ‘all parties concerned to respect their obligations under international humanitarian law and international human rights law’. “Most Irish citizens cannot understand why their government did not back this reasonable and balanced resolution,” Mr Adams said. In failing to support the motion, the coalition government claimed their stance was in line with a “collective” EU approach to seek more “balance” for Israel’s stance. And although the EU is dominated by strong allies of Israel such as Britain, France and Germany, Dublin insisted there had been no change in its policy on the Middle East. Since 1919, previous Dublin governments have worked to advance recognition for Irish nationhood at the United Nations and its forerunner, the League of Nations. So the decision to toe the line of an EU policy which is sharply at odds with its own record of statements in support of Palestine and its people has raised questions over the status of Ireland’s sovereignty within the European Union. A significant factor may be that the newly appointed Irish Minister for Foreign Affairs, Charlie Flanagan is a member of a ‘Friends of Israel’ group at the Dublin parliament. Flanagan came in for intense criticism from Sinn Fein in particular, and the government’s own TDs have become increasingly critical of its approach to the Gaza atrocities, and the decision to simply toe the line of centralised EU policy at the UN appeared to bring matters to a head. A number of prominent Labour Party TDs pointed to the considerable effort the 26 County state made to win a seat on the UN Human Rights Council for the first time. Joe Costello, a former minister of State for foreign affairs, said the vote was “most disappointing”, and warned that it would help to undermine UN efforts to inquire into human rights abuses in the conflict. “In the past, Ireland has been to the forefront in leading EU thinking on the Middle East and took the initiative in November 2012, persuading many EU countries to support recognition of Palestine as a non-member state with observer status at the United Nations,” he said. “With the entire EU abstaining on the proposal for a commission of inquiry on grounds of imbalance and bias, it augurs badly for the outcome of that commission’s deliberations,” he said. The Irish representative at the UN failed to even speak during the debate at the Human Rights Council, something which Gerry Adams also condemned. He noted that since the passing of the resolution by the UN Human Rights Council, the situation in Gaza had deteriorated further, with the Israeli military targeting a UN school resulting in the deaths of even more children. At the Dail, doctors, nurses and paramedics held their own protest against Israel’s targeting of hospitals, clinics, ambulances and medical personnel. “Hospitals, schools, mosques, homes, the entire infrastructure of Gaza is being targeted and the people there are being terrorised and traumatised by the world’s fourth largest military,” said Zoe Lawlor, coordinator of Gaza Action Ireland, which organised the protest. “It could hardly be made any clearer than Israel is deliberately targeting civilians,” she said. The GAI said was a “disgrace” that the 26 County state was dragged into an EU language of ‘balance’ that was just a “front for shameful capitulation.. to Israeli intransigence”. At a rally in support of the people of Gaza in Belfast city centre, a small group of loyalists emerged from a side street provocatively waving Israeli flags, leading to scuffles. The largest protest was in Dublin on Saturday, where several thousand people attended. 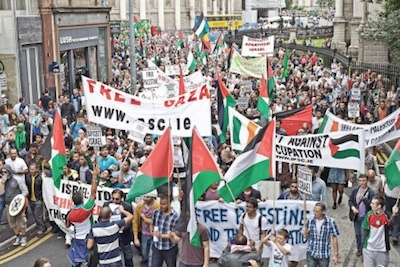 Up to 10,000 marched through Dublin city centre to protest against the Israeli violence before ending at the Israeli and US embassies in Ballsbridge afterwards. One protester who breached the barrier at the Israeli embassy was seized by Gardai and was dragged unconscious feet first along the road while he was suffering an epileptic fit, his head bouncing on the tarmac. Later, a ‘die-in’ demonstration saw a large crowd of people lie down ‘dead’, first in front of the Department of Foreign Affairs and then again at the top of Grafton Street, while holding pages bearing the names of the dead in Gaza. The protests are set to continue this week. See ipsc.ie for updates.